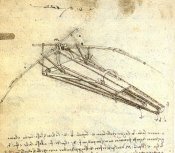 1 Hundreds of years before the invention of the first working airplane, Leonardo da Vinci drew sketches of airplanes, gliders, helicopters, and even a parachute. 2 It's no wonder that flying machines were a favorite of Leonardo's. He had been interested in birds since an early age. As an adult, he would buy caged birds at the market and then let the birds fly free. He also watched birds closely, trying to figure out just how they flew. He drew sketches of ideas for machines that might one day allow people to fly. Drawing sketches of new ideas was something Leonardo must have enjoyed, too. He filled thick notebooks full of these ideas. 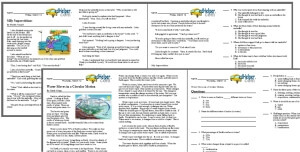 3 One of his ideas was for an ornithopter. An ornithopter was a machine that would allow a man to fly like a bird. It consisted of two large wings attached to a center board where the pilot would lie face-down to operate the machine. The wings were modeled after the wings of a large bird. A system of pulleys and rods operated by the pilot's feet would flap the wings. A tremendous amount of strength and work would have been needed to get the ornithopter off the ground. At that time, there were no gas or electric engines for power. The only power available to operate an aircraft was human power. And humans, it seemed, were just not strong enough to flap their wings like a bird.